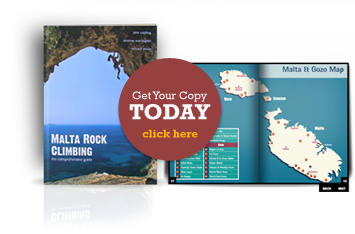 Malta enjoys some of the widest range of climbing. With a rugged rock landscape you can enjoy quiet and rural climbing a short drive from where you are staying. With many glacier cut rock valleys and rugged coastal cliffs, Malta is an ideal place to enjoy climbing mixed with a great all year round weather. If you are looking for rock climbing and guiding in Malta, you can contact Andrew Warrington through MC Adventure to arrange guiding, training, advice and equipment hire for all aspects of climbing in Malta. MC Adventure has a team of experienced guides who know the Island inside out and can always find a great place to climb to suit any grade or experience. From sport routes of most grades to bouldering, SLT and multi-pitch coastal climbs we have something for you. Visit MC Adventure for more rock climbing details and guide pricing.